SAT essay: Should you write a separate summary or weave it together with the persuasive techniques? Should you separate the summary from the analysis when you write your SAT essay? I recommend you separate your summary and analysis. Here’s why: it’s easier. You want to be sure to include a complete summary in your response as well as a complete analysis of the persuasive techniques used in the prompt. If you write the summary as a separate paragraph, you are sure you have supplied a complete summary. If you weave the summary and analysis together, you might leave part of your summary unsaid. Weaving all the elements into your response in an integrated way might be possible. But more likely, your summary or your analysis will suffer. It will be clearer to you as you write that you are covering what you need to if you isolate the two important elements, the summary and the analysis. Weaving everything together is a more elegant way to write, but it is also a more difficult way to write. The exam is stressful enough without adding another layer of difficulty. Unless you have received perfect scores on AP lang or AP lit, I would not attempt it. There is not one perfect way of writing your response. Rather, there are several good ways. Focus your time on the analysis part of your response; that is the part whose score is usually lowest. Focusing on that part of the essay can improve your score the most. What are persuasive techniques used in the SAT essay prompt? Most students writing the SAT essay find summarizing the persuasive essay prompt to be easier than explaining why the prompt persuades. But analyzing and explaining the prompt is an important part of your essay response. It is an area where you can pull ahead if you know how to do it. There are many reasons why a prompt might be persuasive. Let’s list some of them here. 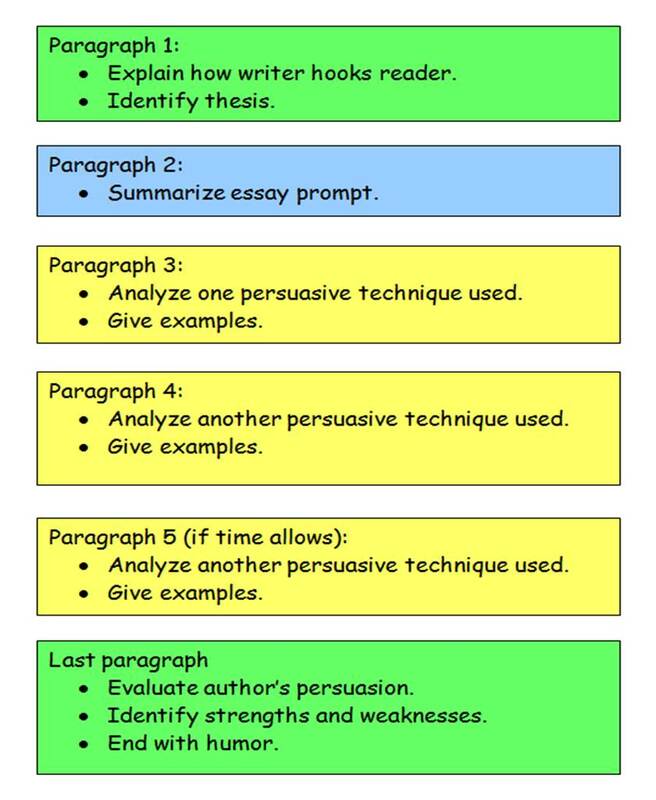 When you analyze why the essay prompt is persuasive, you must identify several of the above techniques which the author uses. You must give one or more examples of the techniques you identify. And you must explain why using each technique persuades readers to the author’s point of view. More of that in future blogs. write your response in excellent, stylish English. When you write a summary for the SAT essay response, I recommend you start with a one-sentence summary of the whole essay prompt. Why? Doing so proves you know what the essay is all about, what the gist of the essay is. In the few sentences which follow, you can elaborate by stating the supporting main ideas. For example, suppose you were to write a one-sentence summary of the US Declaration of Independence. The first section of that document introduces the idea that the colonies are breaking away from Great Britain and that the world deserves to know why. The second section identifies the legitimacy of such a break by any people who think their government is not supporting their rights. The third section names the many grievances the colonial people have against King George III and his government. The last section declares the independence of the 13 colonies. Thomas Jefferson wrote the Declaration of Independence to tell the world why the colonies were breaking away from their long established relationship with Great Britain and were declaring their independence, and why they had the right to separate. All the important information is in this one sentence: the author, the name of the piece of writing, and the major ideas of the document. Let’s try another. How about summarizing Romeo and Juliet in one sentence? In Italy hundreds of years ago, Shakespeare has two teenagers meet, fall in love, and marry despite a feud between their families, leading to a tragic ending for the young lovers. Or how about To Kill a Mockingbird? Author Harper Lee has a precocious white girl, her brother, and their friend taunt a reclusive neighbor while the children’s father defends an innocent black man on trial for his life in 1930’s rural, bigoted Alabama. In each of these one-sentence summaries, almost all details are left out. Leaving out major details can be hard for some children. Even teenagers sometimes can’t figure out what is most important. That is why writing one-sentence summaries takes practice. You will have one major help: the thesis is given to you. In the paragraph following the essay prompt, the thesis is named. Many times you can wrap your summary around its ideas. Should you write the SAT essay? Will you or your child be taking the SAT in December? Here are some facts to keep in mind as you make your decision about writing the essay. None of the Ivy League universities (Brown, Columbia, Cornell, Dartmouth, Harvard, Pennsylvania, Princeton and Yale) requires the SAT essay any more. Stanford strongly recommends writing the essay as does Georgia Tech. West Point requires it. About 10% of US colleges and universities require the essay. The less prestigious the college, the more likely it does not require the essay. Unlike the multiple choice math and writing sections of the SAT, the essay score is subjective based on the judgment of two readers (possibly two machine readers). A perfect score is 8 based on each of the two readers giving a score of from 1 to 4. The score on the essay is based on one written response to one essay prompt, unlike the scores on the math and writing portions which are based on dozens of questions, each with just one correct answer. Factors that could influence your score include your reaction to the subject matter of the prompt, your familiarity with the culture and writing style of the prompt writer, and who grades your essay. The likelihood that you will achieve a perfect 8 on the essay is one percent, according to an analysis of College Board data by Compass Education Group. The essay you need to write is judged on three criteria: how well you summarize the main points of the essay; how well you identify and analyze why the prompt persuades; and how well you write your essay in English). The hardest of these three criteria to score well on is the analysis of the prompt’s persuasive techniques. More than 80% of test takers receive a score of 4, 5, or 6 on the summary and writing aspects of the essay but receive a 3, 4, or 5 on the analysis, according to Compass Education Group. 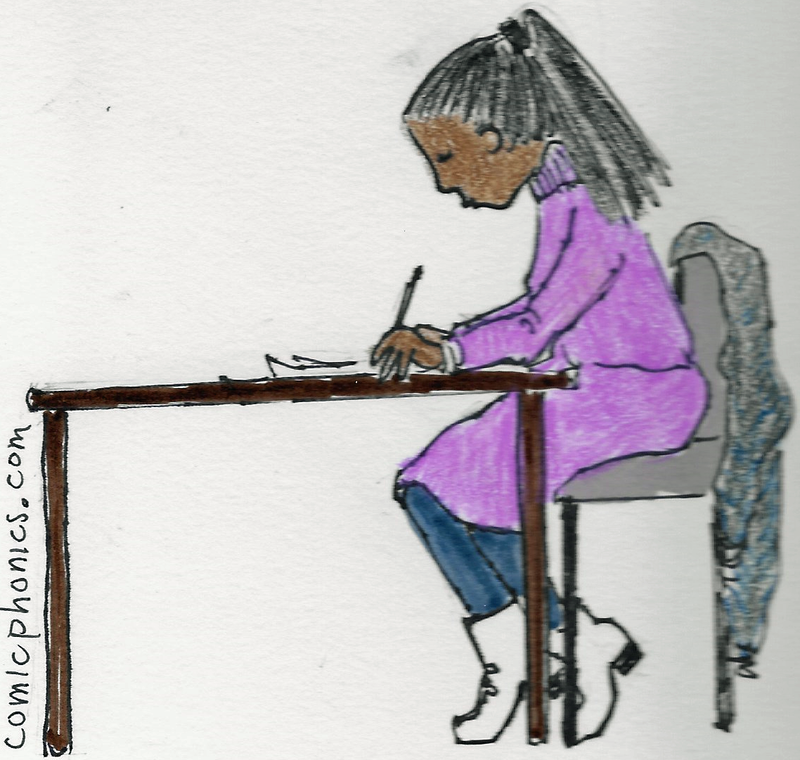 Readers/scorers of the essays seem reluctant to give the highest or the lowest scores. So like a bell curve, most scores cluster in the middle range of possible scores. You can think of the essay scoring as like the scoring of competitive gymnasts, with each athlete’s score decided somewhat subjectively by the judges. If you score a 6 on your essay and your friend scores a 5, does that mean your essay is better than hers? No. What if you score a 6 and your friend scores a 4? Yes, in that case, you probably did write a better essay. If your college choices don’t require an SAT essay, then you should probably skip writing the essay and lose no sleep over that decision. But if you are an excellent writer, then you should probably write the essay. If you do well under test conditions—50 minutes to read, understand, and analyze a prompt, and to respond in essay format in near perfect English—the advantage is yours. When working with students learning how to write an essay for the new SAT exam, I draw diagrams of an essay pattern they can follow. The diagram acts as a prewriting organizer. It shows students an overall perspective of what they must write. Here is a diagram that is easy to follow yet leads to an effective SAT essay. This diagram separates the persuasive techniques from the summary. In the SAT workbooks, the best essay samples entwine the summary and the persuasive techniques, a more sophisticated pattern to follow. What is important is to cover all three of the criteria which will be judged: 1) clearly showing that you understand what the essay prompt is all about (the summary), 2) recognizing and analyzing persuasive techniques, and 3) doing all this using excellent English (perfect grammar, a variety of sentence patterns, advanced vocabulary and–most difficult of all–your own voice). Big changes have come to the SAT essay. It’s optional, not required any more. You have 50 minutes, not 25, to complete it. It’s based on a reading passage, not an out-of-the-blue idea. It will be judged on three criteria: your understanding of the reading passage, your ability to analyze the reading passage, and your writing skills. 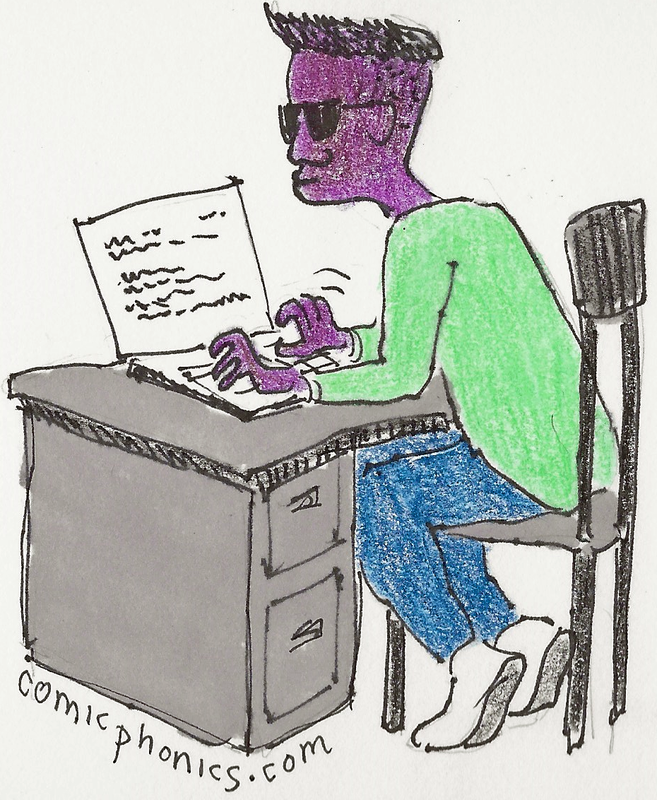 It’s still not easy, but it’s certainly more like the writing students do in college. Often college students need to read a book or a journal article and write a response to it. Students need to show that they understand what the reading is about, that they can analyze the thinking that went into the passage, and that they can do so in clear, sophisticated English. Rarely are college students ever offered a philosophical problem with no warning and no preparation, and rarely too are they asked to respond with an essay in one sitting. The old, 25-minute limit was ridiculous. Planning a response was reduced to three minutes; writing was limited to 20 minutes; and checking for errors lasted about two minutes, or more often, not at all. When I work with students on writing anything we spend significant time on planning, developing details and ordering the paragraphs. You can’t do that in three minutes. And for most of the writing college students do they have overnight or longer to provide a response. Good writers put their writing down, take a walk or a hot shower, and then return to the writing inspired. At least with the new SAT there is breathing room. Even though the reading selection might contain highfalutin vocabulary, you don’t need to understand every single word to get the gist of a reading selection and to analyze it. The reading passage is long enough and contains enough persuasive arguments that the student can readily understand it with a strong high school vocabulary. And the essay is optional. For students who can write, this is their chance to prove it, adding another way to impress college admission officers. For students who can’t write well, their lack of skill will show in the multiple choice section of the writing test. Google the new SAT writing test to find websites offering greater perspective on the change. See if you agree that the change has improved the test. What can we learn from the grammar part of the SAT to help with writing? The SAT is a test used to determine whether a student is well prepared for college-level work. Part of the SAT tests students on grammar by asking students to replace poorly worded sentences with error-free ones or to pick out the erroneously used word/s from several choices. The SAT uses the same kinds of errors over and over. If high school students have trouble with these kinds of errors, younger children are likely to also. Students need direct instruction on these kinds of errors.Children are not likely to recognize these errors or know how to fix them without instruction. Run-on sentences and sentence fragments. Often, one clause is started, but it is interrupted by a second clause and the the first clause is not finished. Or a fragment is so long it seems to be a sentence. Students need to recognize that every clause needs a subject and a verb. Subject-verb agreement. This means that a singular subject should be paired with a singular verb, or a plural subject should be paired with a plural verb. 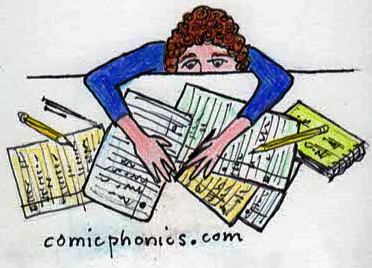 For example, “Her homework is done” (both subject and verb are singular) or “Each of the children does well” (Each is the subject, so it is paired with a singular verb, does). Verb tense problems. In general, paragraphs are written in the same verb tense, but there are good reasons to use more than one verb tense. However, the writer can’t change tenses willy-nilly. Dangling participles. Sentences which start with “Hearing the door open” should be followed immediately with the person who is doing the hearing. Parallel structure. This means two or more ideas in the same sentence should be worded using similar grammar. In the sentence, “I like skipping rope and to play soccer,” the sentence should be rewritten to say either “skipping rope and playing soccer” or “to skip rope and to play soccer.” These are simple examples, but the SAT usually uses examples which are more difficult to discern. Each, every, any, nothing, none, everything, and anything are singular pronouns and take singular verbs. I tell students to mentally insert the word “one” after these words to remind them that these words take a singular verb. Verb/prepositions pairs. Some verbs are always followed by certain prepositions. This can be hard because some verbs when used one way take one preposition, but when used another way take a different preposition. Hearing these pairings used correctly for years is enough for most students to figure them out, but for other students, these pairings must be memorized. Words which sound similar. Since their meanings differ, they cannot be substituted one for the other. And some words which sound the same can be spelled differently depending on the meaning. They cannot be substituted either. Apostrophes. Possessive nouns use apostrophes but possessive pronouns do not. Once children learn about apostrophes, they confuse simple plurals which don’t need apostrophes with possessive plurals. Lots of practice is needed for correct use of apostrophes to sink in. Their, there, they’re; it’s, its; and too, to, two befuddle students. 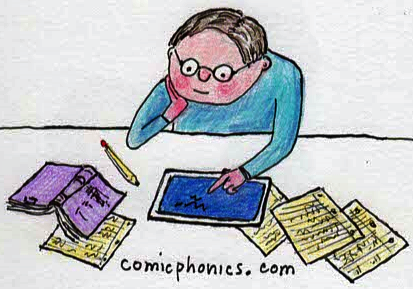 Like apostrophes, learning when to use these words takes lots of practice. Why is it important to master grammar? Spell check can find some of these errors, but not all. Or it can suggest what words are probably in error without suggesting a way to fix them. You need to be able to find your errors. But more importantly, when we write, we are trying to impress someone with our ideas. The grammar should be invisible. If grammar draws attention to itself because of errors, you have lost some of your power to impress others. For children, that could mean a lower grade on an essay, but for an adult, that could mean being rejected by a university or by a potential client.